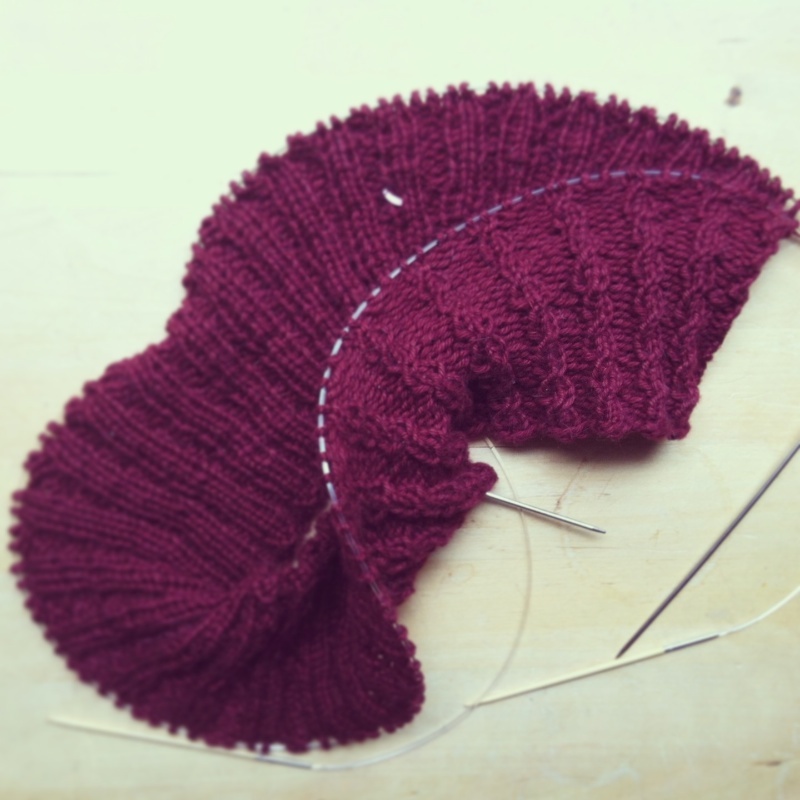 It would have been easy to skip ahead on the Nachtfalter Knitalong with it's baby cable rib bottom. Even though it's tough on my wrists I found myself thinking, "Just oooone more twist round." and so I'd continue on for another hour. 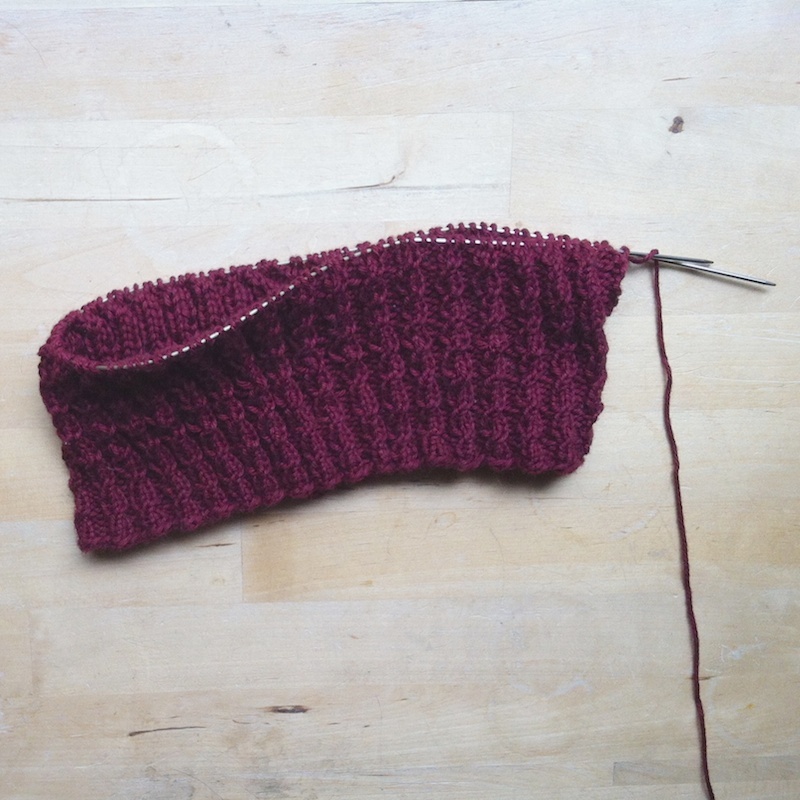 If this ribbing looks different than my swatch last week that's because it is. I was twisting every other row instead of every fourth. Like some other knitters in this KAL, I was worried about this ribbed bottom not fitting me. Ribbing usually looks sloppy on me the first time around. After I unknit the bottom, decrease stitches, and reknit it, it finally fits. I cannot remember how many times I've had to do that, but I'm trying to break out of that knit, worry, reknit cycle by starting smaller on my ribbing. 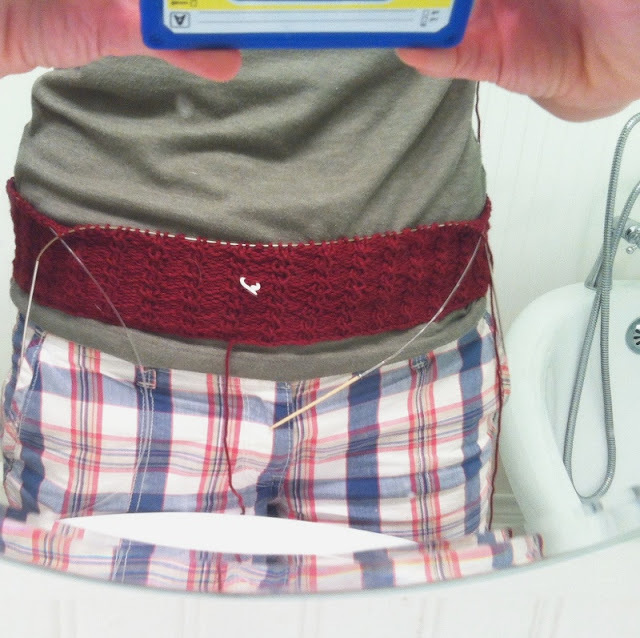 I just don't knit very tightly. This sweater has been no exception. I decided to knit a 32" bust, which also has a finished 32" waist measurement. My waist is smaller than that, but my hips are 35" so I think that's the measurement I'm needing to accommodate. I knit on, but it was looking small... as in, toy poodle sweater small. After I had this week's goal finished (about 4 inches) I ran a large circular through it and tried it on. Whew! It does fit with room to spare, so I'm not going to think about it anymore. Ah, bathroom photos. You can find more on my Ravelry and Flickr - obviously, I don't mean bathroom photos. The knitalong is happening here if you want to join in. You know you want to join in. It looks so beautiful! I love that color. So wish I had time to be part of this KAL! I typically can follow instructions as written as my knitting tension is pretty even but after knitting a few inches on the ribbing & trying it on, it was way too loose. I've gone down a needle size & it seems just about right now ~ so excited about getting to the lace! looks really nice! and as always I love your yarn choice! Me too! I may sneak ahead a bit this week. I have a back up project in case I finish early. Thank thanks, Monica! I got a little help with this creative color combo by looking at the pattern photo. I would never have thought to pair this red with a blue but I think they look incredible together. That's a gorgeous pattern and I loooove the colors you chose. Wow. Joining the KAL is kind of tempting. I have a lot of half-finished projects, but I want to start something NEW. Ahh. I have some bright yellowish-green Rowan cotton that was going to be an Orangina... ten years ago. Maybe it should be a Nachtfalter? Thanks, Stephanie. If you join, you could totally catch up by knitting all of the bottom ribbing this week. Everyone in the KAL wanted to do all of it the first week and some did finish ahead. I made myself stop. It would be fun to have you join us!